Narrowing or obstruction of a coronary artery. A rapid arrhythmia, causing an imbalance in supply and demand for energy. A short period of ischemia causes reversible effects: The heart cells will be able to recover. When the episode of ischemia lasts for a longer period of time, heart muscle cells die. This is called a heart attack or myocardial infarction. That is why it is critical to recognize ischemia on the ECG in an early stage. Severe ischemia results in ECG changes within minutes. While the ischemia lasts, several ECG changes will occur and disappear again. Therefore, it may be difficult to estimate the duration of the ischemia on the ECG, which is crucial for adequate treatment. An exercise test such as a bicycle or treadmill test, may be useful in detecting myocardial ischemia after exercise. 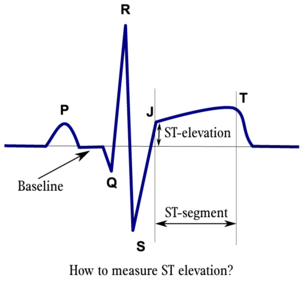 In such a test, continuous ECG monitoring is performed during exercise. The ST-segment, blood pressure and clinical status of the patient (i.e. chest complaints) are monitored during and after the test. The ECG shows ST elevation or depression. So detection of elevated serum cardiac enzymes is more important than ECG changes. However, the cardiac enzymes can only be detected in the serum 5-7 hours after the onset of the myocardial infarction. 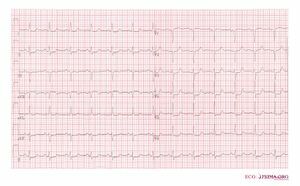 So, especially in the first few hours after the myocardial infarction, the ECG can be crucial. New ST elevation at the J-point in two contiguous leads with the cut-off points: ≥0.2 mV in men or ≥ 0.15 mV in women in leads V2–V3 and/or ≥ 0.1 mV in other leads. ST depression and T-wave changes. A study using MRI to diagnose myocardial infarction has shown that more emphasis on ST segment depression could greatly improve the yield of the ECG in the diagnosis of myocardial infarction (sensitivity increase from 50% to 84%). Overview of the separate ECG leads. The lead with ST segment elevation 'highlights' the infarct. An infarction of the inferior wall will result in ST segment elevation in leads II, III and AVF. A lateral wall infarct results in ST segment elevation in leads I and AVL. An Anterior wall infarct results in ST segment elevation in the precordial leads. 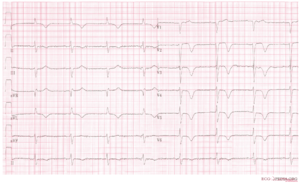 The coronary blockade can cause conduction block, on AV nodal, His or bundle branch level. The heartmuscle itself is very limited in its capacity to extract oxygen in the blood that is being pumped. Only the inner layers (the endocardium) profit from this oxygenrich blood. The outer layers of the heart (the epicardium) are dependent on the coronary arteries for the supply of oxygen and nutrients. 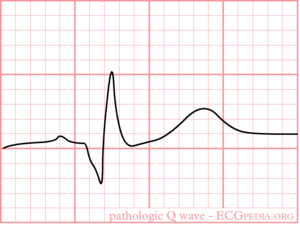 With aid of an ECG, the occluded coronary can be identified. This is valuable information for the clinician, because treatment and complications of for instance an anterior wall infarction is different than those of an inferior wall infarction. The anterior wall performs the main pump function, and decay of the function of this wall will lead to decrease of bloodpressure, increase of heartrate, shock and on a longer term: heart failure. An inferior wall infarction is often accompanied with a decrease in heartrate because of involvement of the sinusnode. Longterm effects of an inferior wall infarction are usually less severe than those of an anterior wall infarction. The heart is supplied of oxygen and nutrients by the right and left coronary arteries. The left coronary artery (the Left Main or LM) divides itself in the left anterior descending artery (LAD) and the ramus circumflexus (RCX). The right coronary artery (RCA) connects to the ramus descendens posterior (RDP). With 20% of the normal population the RDP is supplied by the RCX. This called left dominance. Below you can find several different types of myocardial infarcation. Click on the specific infarct location to see examples. The localisation of the occlusion can be adequately visualized using a coronary angiogram (CAG). On the CAG report, the place of the occlusion is often graded with a number (for example LAD(7)) using the classification of the American Heart Association. Wellens syndrome: symmetrical negative T wave in pre-cordial leads without R loss of R waves can regularly be observed in early anterior ischemia. Many patients with Wellens syndrome / sign turn out to have a critical proximal LAD stenosis. Typical negative T waves post anterior myocardial infarction. This patient also shows QTc prolongation. Whether this has an effect on prognosis is debated. The cardiomyocytes in the subendocardial layers are especcially vulnerable for a decreased perfusion. Subendocardial ischemia manifests as ST depression and is usually reversible. In a myocardial infarction transmural ischemia develops. In the first hours and days after the onset of a myocardial infarction, several changes can be observed on the ECG. First, large peaked T waves (or hyperacute T waves), then ST elevation, then negative T waves and finally pathologic Q waves develop. 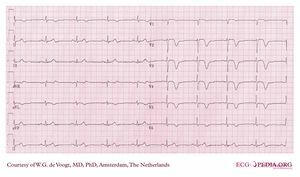 Wellens syndrome or sign (see image) can be an early ECG warning sign of critical anterior ischemia before the development of overt mocardial infarction. Subendocardial ischemia is ischemia that is not transmural. It is mostly caused by demand ischemia where energy supply to cardiomyocytes is insufficient for the work force, e.g. during extreme hypertension, aortic valve stenosis, extreme left ventricular hypertension, anemia, atrial fibrillation with rapid ventricular response. On the ECG often diffuse ST depression is present. Cardiac enzymes (CK-MB, Troponine) may or may not be elevated depending on the severity. This page was last edited on 28 October 2012, at 21:53.